A ballet in two acts, The Nutcracker opens in Chicago on Christmas Eve, 1892, mere months before the opening of the World's Columbian Exposition of 1893, also known as the World's Fair, a marvel unlike anything the city has ever seen. Marie and her younger brother Franz arrive at home, where their immigrant mother-a sculptress of modest means-designs the seminal masterpiece that will preside over the Fair. A festive Christmas potluck ensues, only to be interrupted by the mysterious Great Impresario, creator of the World's Fair. 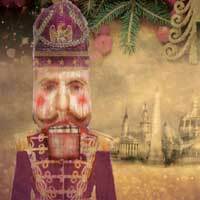 He entertains with enchanting visions of the what's to come, distributing gifts in the process, which includes a mercurial nutcracker for Marie. That evening, Marie awakens to an epic battle between toy soldiers and rats led by The Rat King and the now life-size Nutcracker. Unexpectedly, Marie saves the day, as The Great Impresario and the Nutcracker, now transformed into a Prince, set sail on a magical journey into the night. "...This time around, the ballet seemed shorter than ever. Indeed, at two hours, including a 20-minute intermission, it�s one of the most condensed Nutcrackers anywhere. That comes at a cost, including the deletion of the soldier�s and ballerina�s novelty dances in the first act, some of the Snowflakes� ensemble music in the second, and much of the pas de deux in the final act. This may be fine for children�s attention spans, but Tchaikovsky and adults deserve more." "...The holiday season is all about tradition. From trimming the tree to baking cookies to replaying tunes already heard too many times to count, each year as the days shorten and the chill of the frost finds us, we find ourselves craving the familiar comfort of the known. The ballet, �The Nutcracker,� holds high rank among America�s holiday favorites alongside hanging stockings on the mantel and drinking too much eggnog at office holiday parties." "...Now in its third season, the Joffrey Ballet�s radiant and altogether ingenious production of choreographer Christopher Wheeldon�s Chicago-themed reinvention of �The Nutcracker� is more luminous than ever. And watching this year�s opening performance of the holiday classic it was impossible not to think back to the ballet�s world premiere, and to recall what a miracle that opening night in 2016 turned out to be." "...The old, traditional �Nutcracker� story is likely to continue in stories put on by dance groups everywhere. But the Joffrey�s new �Nutcracker� is delightfully fresh, beautifully performed and artistically presented." "...I can tell you a lot about The Nutcracker, but I�ll never quite be able to find the words to describe the look on my eight-year-old daughter�s face as she watched this beautiful ballet� how it moved her� what it meant to her. And I�ll never be able to describe the dreams she dreamed the night after we went together to go see the Joffrey�s modern holiday masterpiece." "...Rich and whimsical, The Joffrey Ballet's The Nutcracker is a splendid event for all ages. Audiences familiar with the piece or new to its magic will likely be spellbound by its smartly updated setting and evocative execution. With a rotating cast of principals throughout its run (visit the Joffrey Ballet's website for a listing of performers by date), this is a holiday treat many won't want to miss."